So you want to make your own personalized, custom envelope? If you are a little crafty, this project will be a cinch. The great thing about making your own custom envelopes is that they can be built to be any size you want with any design you like. Like puppies? Use a paper that has dogs printed on it. Want something with an elegant design? Find a decorative paper with a design that catches your eye. We’ll look at what you need to make your own envelope and then discuss the steps that are involved. Of course, if you prefer to buy custom-designed envelopes, that option is available too. But for now, let’s look at what you should gather up before you start working. The first step you are going to take is to use the pencil to jot a line diagonally between corners of your paper. This will give you an X across the paper. Fold two opposite sides of the paper into the center of the sheet. You can utilize a bone folder or rub a coin on the folds to ensure a sharp crease. At this point, you want to fold the bottom point of the paper up until the tip is approximately a half inch above the center. Use your tool again to make sure you have a crisp crease. This will ensure the envelope turns out looking professional. Now you want to fold down the top point, which should also overlap the center by a slight amount. After this, use two pieces of tape to hold the bottom in place. At this point, after inserting your card or letter, you can also add a sticker or other material to hold down the top point. At this point you have a fully custom envelope that will fit whatever you need to mail or hand off to someone. The other option, if you are not DIY-inclined, is to contract a company who can build your custom envelope. There are many of them out there and you can often make various choices to make the envelope exactly what you want. 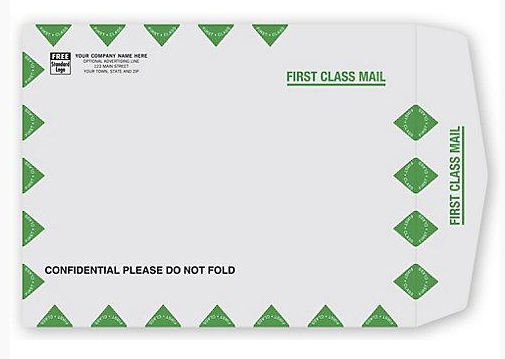 These envelopes can carry the name of your company and even the logo, so your brand stands out. In addition, most custom designed envelopes can be printed on many types of paper and with special images and fonts. Sometimes these companies also offer specialty items like papers, stickers, and other items that can match with the envelopes to offer a comprehensive answer to your needs. Whether you want a one-off custom envelope you make on your own or need a few hundred custom envelopes for a business, these options should get you where you need to be. The sky is the limit when you choose custom envelope services.